Last night, my wife, Nancy, and I got all dressed up for a big formal shindig in Hamilton. It was the annual Applause and Accolades awards dinner for McMaster University’s Faculty of Engineering. Though it may seem strange to some, I earned my degree in mechanical engineering from McMaster and have always been proud to wear the iron ring on the pinkie of my working hand. Last night, despite never practicing formal engineering for a single day in my life, I was humbled to receive the L.W. Shemilt Distinguished Alumni Award named for the revered Dean of Engineering who served for my first couple of years at Mac. It was a wonderful evening. 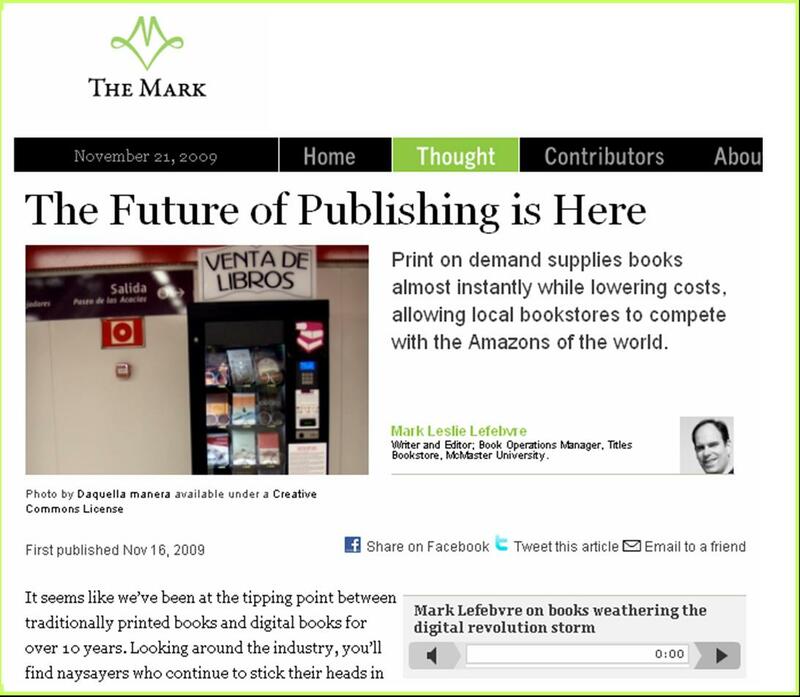 I’ve been scanning The Mark ever since discovering that my friend Mark Lefebvre is a regular contributor. Last week, they called and we did a Q&A that went live this morning. We covered a fair bit of turf in the interview and I hope you find something of interest in it. 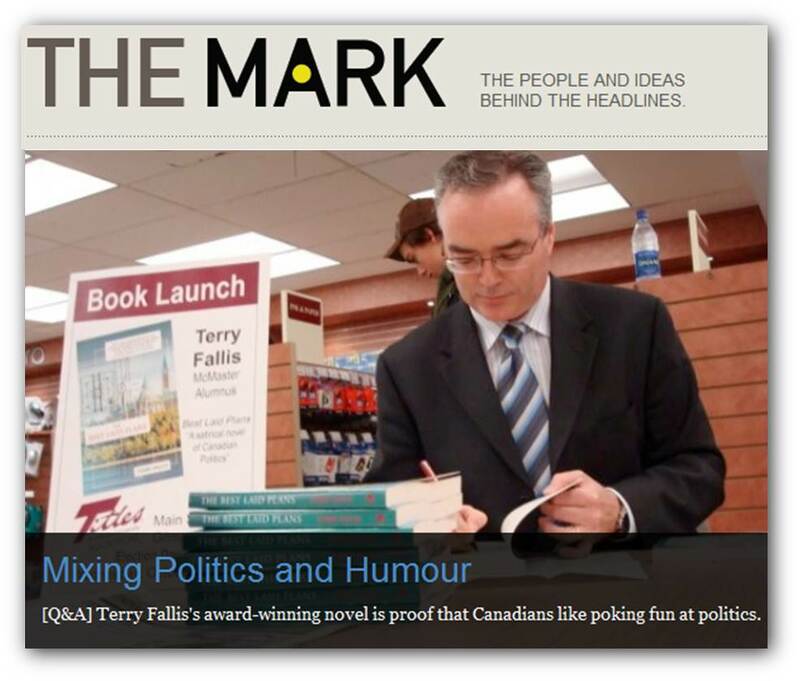 My thanks to The Mark. 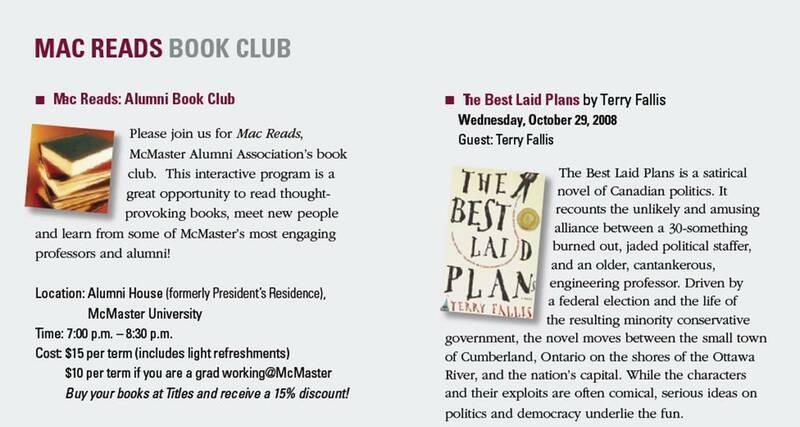 Coincidently, the photo they’ve used is from the 2007 launch of the original self-published edition of The Best Laid Plans in the McMaster University Books Store, graciously organized by none other than Mark Lefebvre (who writes and blogs under the name Mark Leslie). What a great time I had in Creemore speaking to a group of 100 or so. It’s a lovely, picturesque, and arty little town. Michele and Jennifer from the Clearview Public Library met me at an amazing restaurant called Chez Michel. We had a great dinner and then headed over to the Station on the Green. The kind folks from Curiosity House Books were on hand to sell The Best Laid Plans and The High Road. I gave my talk and then the audience fired some very thoughtful questions my way. 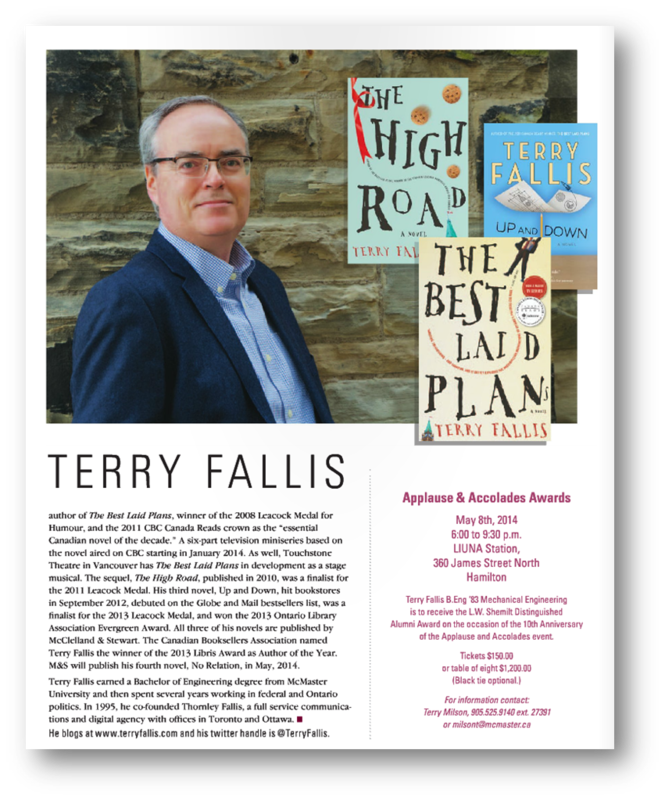 Then I signed books for a while and got back on the road for the drive home. 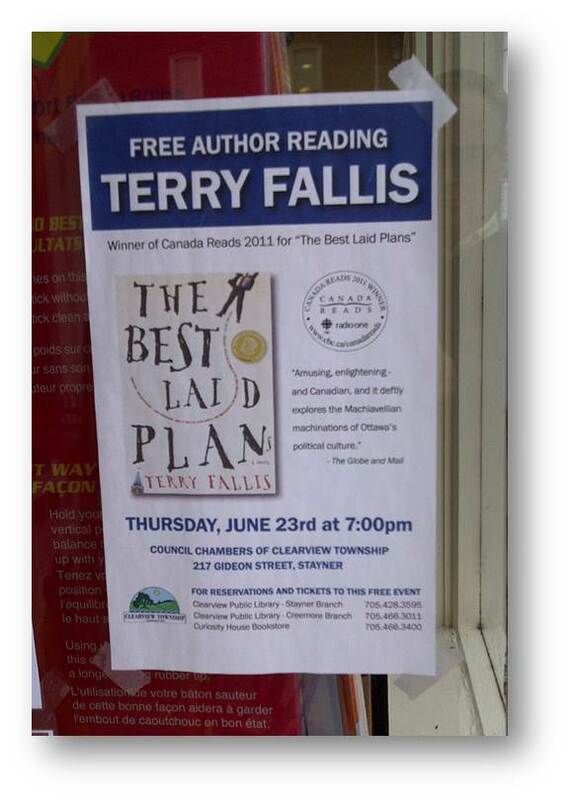 My thanks to the Clearview Public Library for inviting me to come. I had a great time. I had a blast this past Saturday in the beautiful town of Bayfield, Ontario on the shores of Lake Huron. 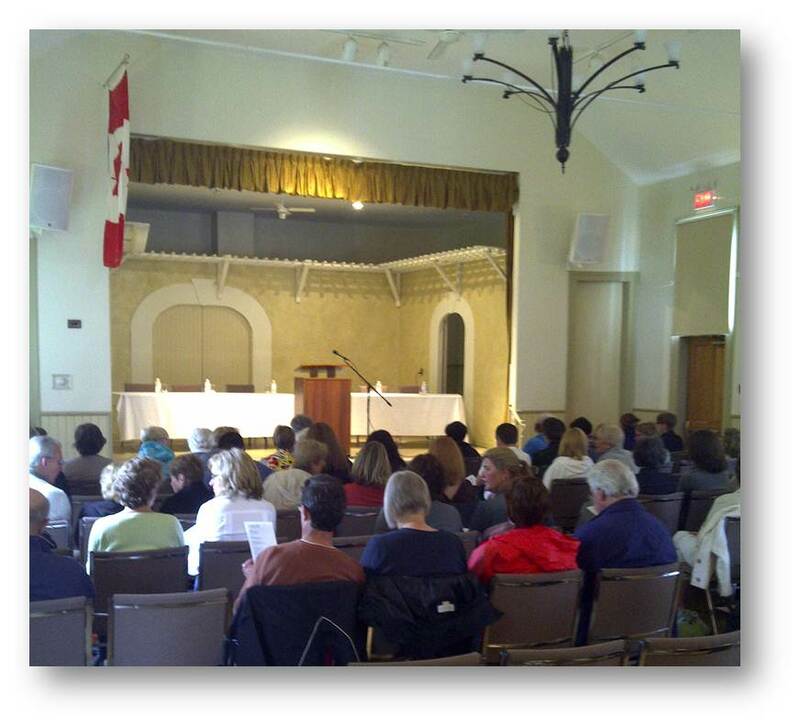 In the afternoon, I read at the Bayfield Writers’ Festival in the Town Hall alongside some wonderful writers. The event was organized by Mary Brown of the lovely Village Bookshop. Joining me were Anne Perdue, author of the short story collection with the very provocative name, I’m a Registered Nurse, Not a Whore, Emma Ruby-Sachs, author of The Water Man’s Daughter, Sarita Mandanna, author of Tiger Hills, and an excellent local children’s poet, Hilary Gillespie. After the reading, we all had dinner together. One of the many benefits of participating in readings is the opportunity to meet other writers. These were all very nice folks whom I hope to see again on the circuit. Here’s the Town Hall just before we headed up to the stage. 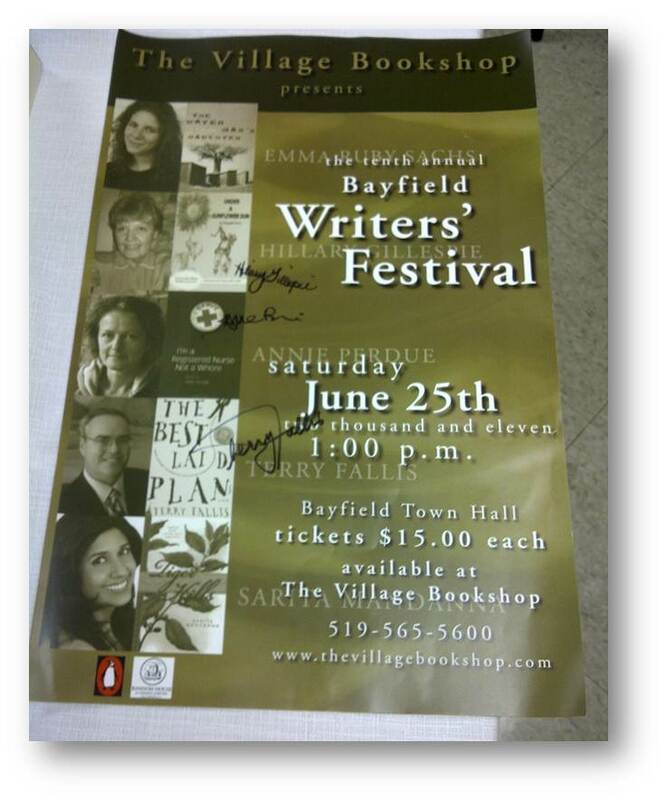 And here’s a shot of the poster promoting the festival that Mary asked us all to sign for the store. 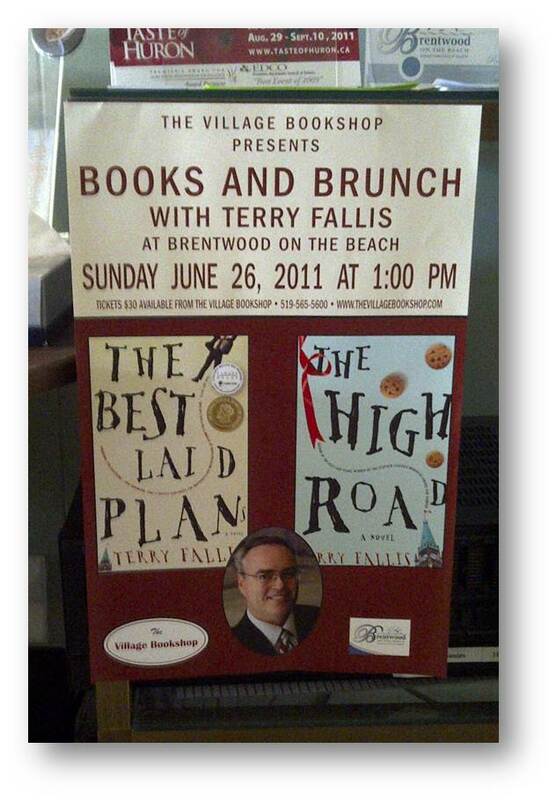 The next morning, I worked on novel #3 before enjoying a wonderful brunch in the Brentwood on the Beach B&B. 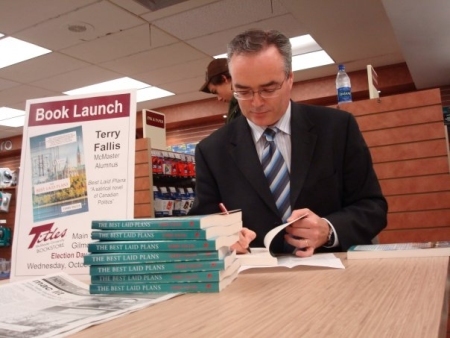 At the appointed hour, I spoke to 50 or so attendees about my writing and answered questions. I thoroughly enjoyed myself and hope to make a return visit sometime. 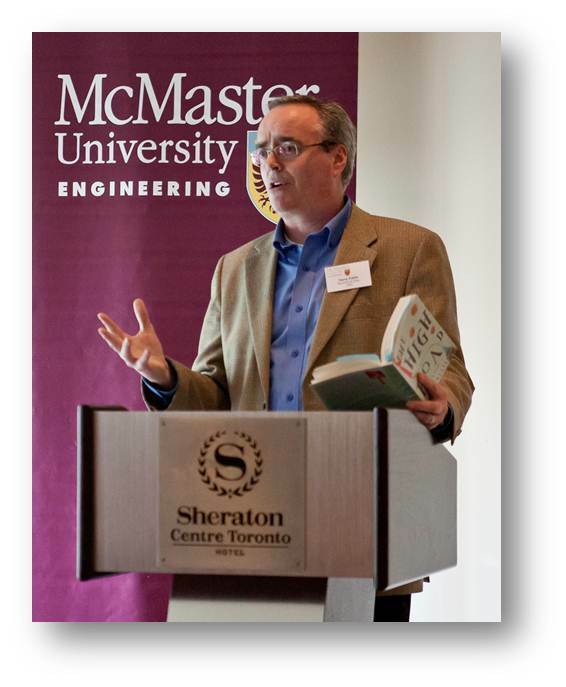 Last night, I spoke at a McMaster Engineering Alumni gathering in Toronto. I have an engineering degree from McMaster even though I’ve never worked professionally as an engineer. My university experience had a considerable impact on the course of my life so I was very happy to be there. I gave a talk about how my engineering education shaped my writing, a topic I haven’t spoken on before. It seemed to go reasonably well (nobody nodded off or walked out in the middle) and I had a great time meeting some newly-minted engineers and some old friends as well. 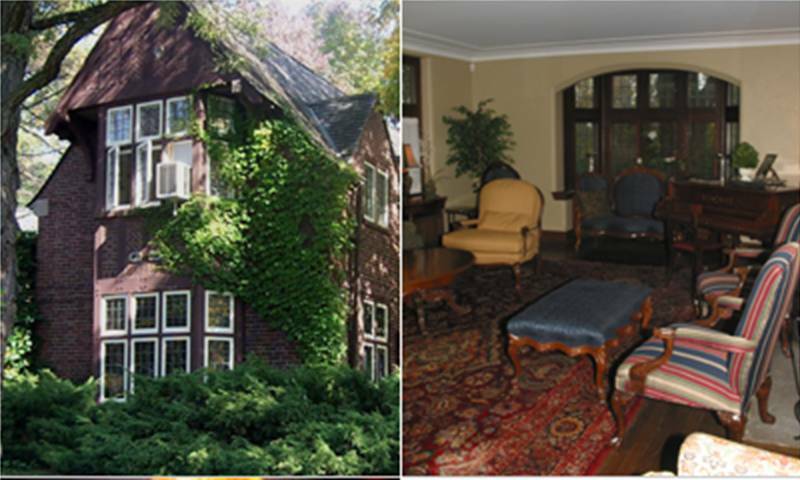 I spent last evening at McMaster University, my alma mater, in the original President’s residence, a lovely old home on the edge of the campus.Â I and about 20 Mac alumni book club members gathered in the stately living room, complete with grand piano, to discuss TBLP.Â I had a wonderful time.Â Everyone was so nice and encouraging about the novel.Â As a newly published writer, hearing that readers love the book, the characters, and the story, never gets old.Â That they also thought the book was funny was icing on the cake.Â Â Many thanks to Amber who organized this very enjoyable event.Â It was just great. Shortly, this e-mail invitation will be sent to hundreds of Toronto-area McMaster Alumni in the hopes of persuading some of them to come down to the beautiful Distillery District in downtown Toronto for an evening meet and greet, talk, and reading.Â I’m really looking forward to it.Â As I’ve mentioned before, McMaster had a hand in shaping my path in life so I’m very pleased to do this event. 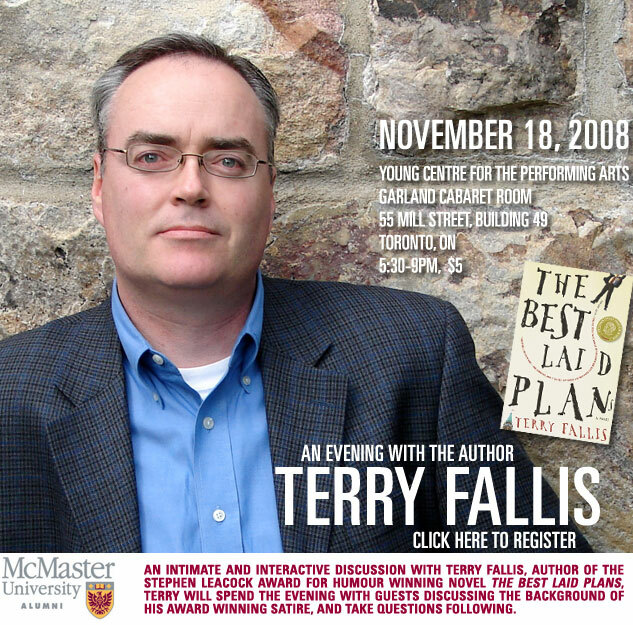 McMaster will always be a special place for me.Â I spent six years there earning a mechanical engineering degree and immersing myself in student politics.Â My McMaster experience led directly to my pursuit of politics after graduation and stints on Parliament Hill and Queen’s Park.Â Jumping ahead, the first official book event I did was a launch and signing at the Mac bookstore Titles last October, thanks to the support and efforts of Mark Leslie Lefebvre a writer and blogger who works there.Â So it’s fitting in a way that on October 29th, just over a year later, and what a year it’s been, I’ll be back at Mac presenting TBLP to the Mac Reads Book Club.Â Who says you can’t go home?